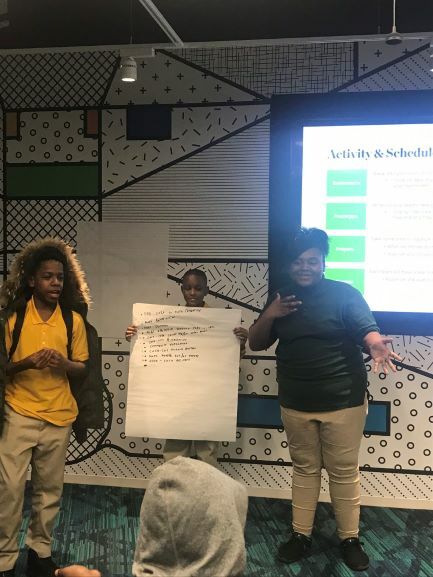 Earlier this month, middle school students from John Hayden Johnson and Charles Hart took a field trip to the Deloitte office in Arlington, VA. This excursion was just one of many unique opportunities made possible by the After-School All-Stars Washington DC, a local charity that provides free after-school programs for low-income middle school students. The trip to Deloitte was part of the Career Exploration Opportunities Initiative, a program focused on exposing students to attainable and attractive career paths that they may not have been aware of, otherwise. As the middle schoolers arrived at the Arlington office, they weren’t sure what to expect. They wanted to know, “What does it mean to be a consultant?” Because many of the students were (like most Americans) unfamiliar with Deloitte, they were eager to hear more about the company from the perspective of dedicated staff members. They were greeted by Maddie Devine, a Deloitte Business Technology Analyst who also graciously serves as the Event Lead for the After-School All-Stars. After a dinner provided by the company, students were given a full tour of the facility that included a breakdown of every department. Deloitte staff members spoke about their current projects, and the students were introduced to the newly renovated Deloitte Digital Studio. The tour culminated in a group activity where students were split into teams and presented with a mock case study, in which they had the opportunity to play the role of ‘Deloitte consultant’ for a notable client: Coca-Cola. The student groups had impassioned dialogues, and then submitted proposals on how Coke might expand its reach in global markets. Then, the groups had the opportunity to pitch their ideas to a few Deloitte staffers. Ranging from athlete endorsements, door-to-door product delivery services, new flavors, and even Coke-sponsored disaster-relief shelters in the developing world, the students’ ideas were amazingly creative and comprehensive. This exercise was impactful: it encouraged the students to be resourceful, to think outside the box, and it served as a wonderful conceptualization of what it means to work for an organization like Deloitte. All at once, the group understood what it means to be a consultant! After-School All-Stars DC is privileged to have Jared Townshend, a Deloitte staff member, as an advisory board member. Jared acts as the official sponsor for ASAS DC within Deloitte, and is the Managing Director for the company within the Government and Public Services team. Together with Maddie, Jared sent the All Stars off in style with parting gifts, courtesy of Deloitte. Staffers posed for a photo with the group, and passed out hot cocoa as students left. The ASAS DC partnership with Deloitte has been characterized by the warmth and hospitality the students experienced on their field trip, and it is greatly appreciated. This trip to Deloitte exposed the All Star students to a career path worth aspiring to. The students left the office full of excitement, expressing admiration for the dynamic work that the consultants take on to meet client-needs. The students all saw themselves serving in similar roles in future careers, and said they’d be proud to work for the organization. 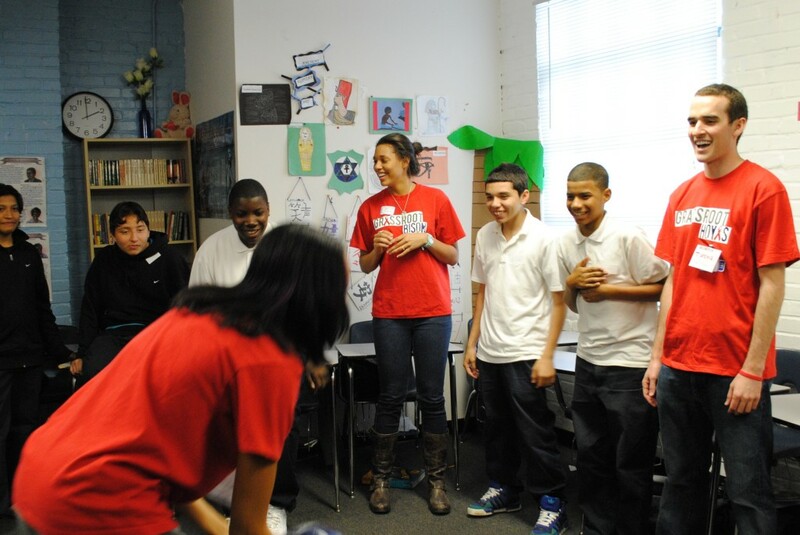 As always, ASAS DC will continue to provide these events to the students we serve. In this way, we will work to expand their worldview, increase their self-esteem, and help them understand the kind of success they are capable of achieving. Educational Theatre Company celebrates 20 years of Changing Lives Through the Arts! 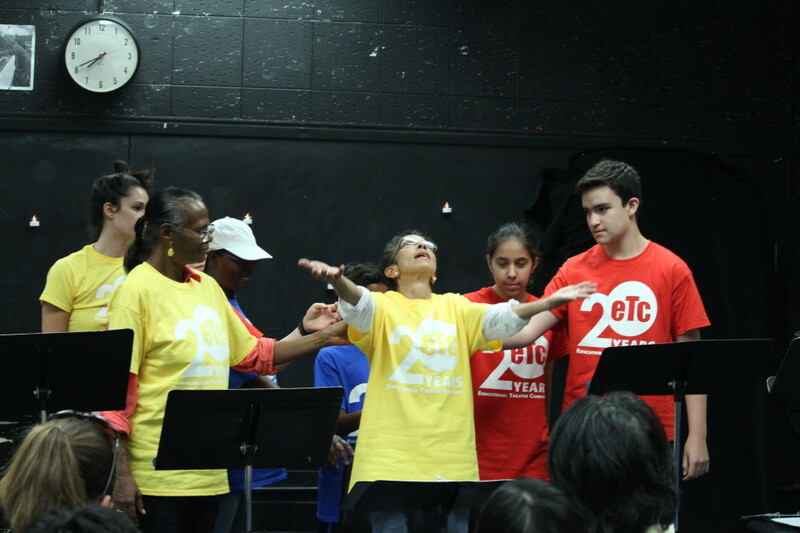 Educational Theatre Company (ETC) invites the community to its 20th birthday fundraiser to celebrate 20 years as a vital part of the Arlington Arts community. 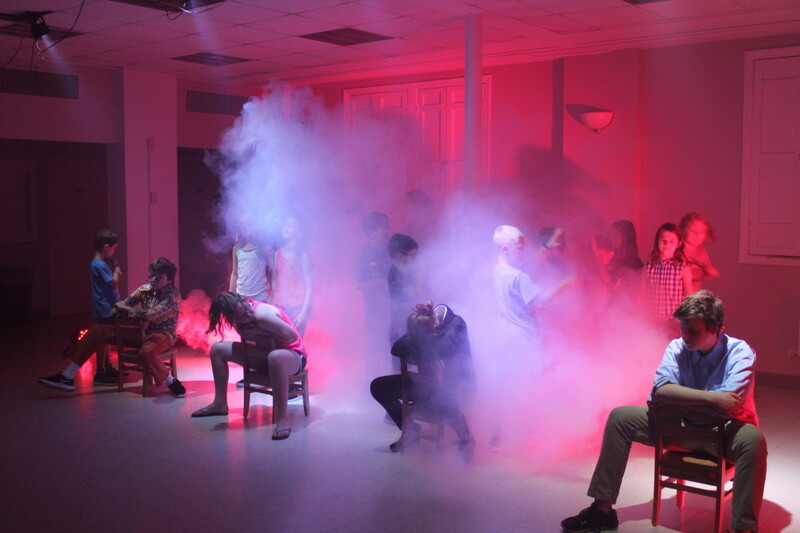 Since its founding in 1998, ETC has been committed to the mission of unlocking the potential of children and adults, ages 3 – 103, through immersion in theatre arts. 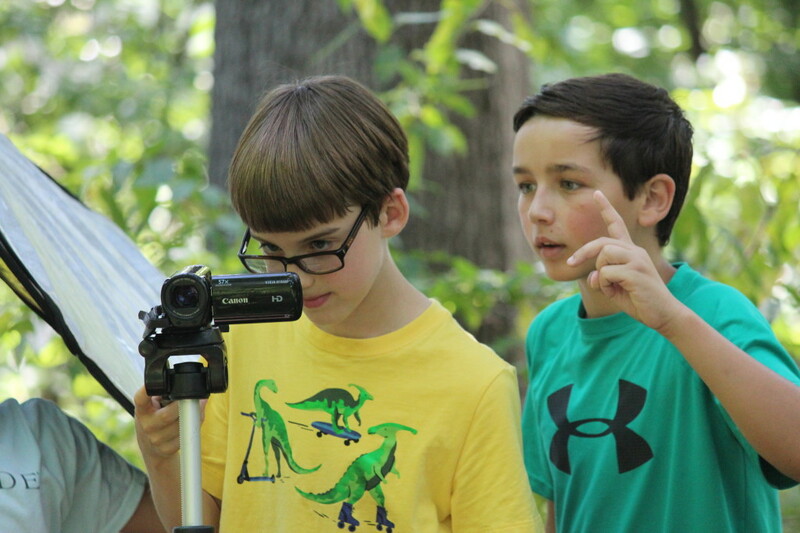 ETC places a focus on student written, process-driven work with programs that foster creativity, teach collaboration and community, and give students a sense of confidence in their own story. Community members are invited to attend ETC‘s birthday party fundraiser on Saturday, November 17. This fundraiser, featuring live performances, music, refreshments, and a silent auction will allow ETC to continue its long tradition of bringing theatre arts to underserved members of the community, ensuring location and economic status are not barriers to participation. The birthday party is from 2:00 – 5:00 pm, in the National Rural Electric Cooperative Association (NRECA) building at 4301 Wilson Blvd. Tickets are $10 per child, $20 per adult, and $40 for a family, and are available at www.educationaltheatrecompany.org. Community members are also invited to see ETC in action by attending the original musical Two Ways to Count to Ten, the McKinley Elementary Main Stage Residency production. 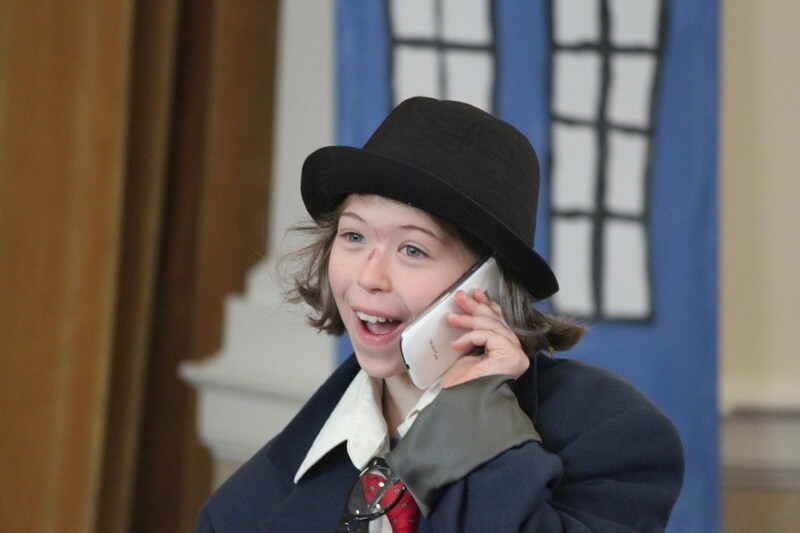 Under the guidance of ETC‘s teaching artists, 2nd through 5th-grade students develop an original script and lyrics, create their costumes, set, and props. This will be the 30th McKinley Main Stage show, continuing the longest running arts partnership with Arlington Public Schools. The free performances are Thursday, November 15 and Friday, November 16 at 7:00 pm at McKinley Elementary School, 1030 North McKinley Road, in Arlington. This back-to-school season, 95 Dream Project Scholars began the 2018-2019 academic year at colleges and universities across the United States. Dream Project awarded a $1,500 renewable college scholarship to these students to ensure that their immigration status – be it TPS, DACA or undocumented – does not block their access to higher education. Not all undocumented students are so lucky. Nationally, only 5-10% of Dreamers, out of 65,000 high school grads, start college each year. 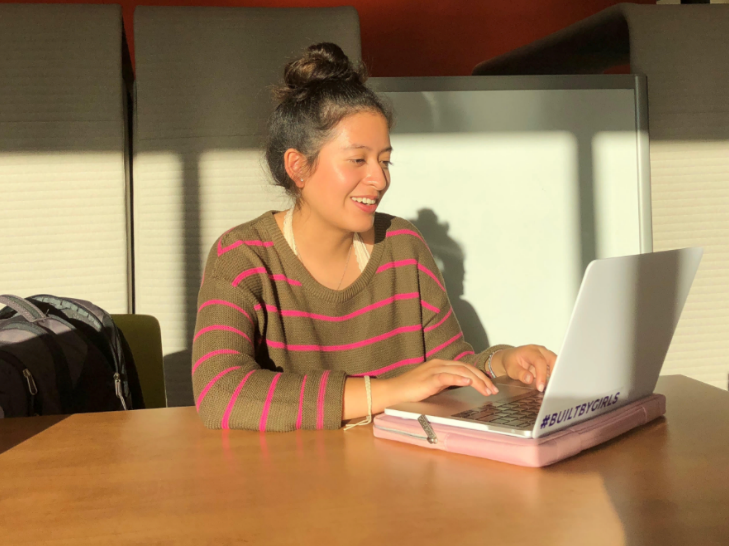 But the Dream Project, an organization that empowers students whose immigration status creates barriers to education, is making strides in changing this statistic for Dreamers in Virginia. 90% of Dream Project Scholars stay in college. And among those students that are in college,?97% say that the Dream Project has played a significant role in their acceptance to college and the success they have found while attending college. The Dream Project provides the necessary tools to empower low-income immigrant students. Over the past 8 years, through scholarships, mentoring, community engagement and advocacy, the Dream Project has aided over 150 immigrant families. Although several new attacks exist to these families – such as President Trump’s decision to end DACA, and the ongoing lawsuits disputing the fate of DACA – The Dream Project is committed to continuing to provide local Virginia Dreamers the support that they need to succeed in college. Everyone can take a step to help the Dream Project distribute more “…signs from the Universe” to Dreamers all around by getting involved. I don’t know who’s happier that school’s back in session, me or my kids. Some days it felt like the longest short summer ever. But now, we’re back in the groove and I’m adjusting to the rhythm of having twins in high school. I know — I’ve been warned. Thankfully I’ve always been pretty good with routine, even if it doesn’t always make me very popular at 6:00 AM. The moment I see the opening of one sleepy teenage eye, my first question is “whad’ya want for breakfast?” Imagine how that goes over. But, I’ll bet those of you like me who have kids are asking that same question and making sure they’ve eaten something before heading off to the bus. Why? Because this is what you know. When kids are fueled up with healthy, delicious foods they are fired up to learn. Here’s something we at Real Food for Kids know. School meals — when done right — fire up kids to learn. But here’s something you may not know. School meals these days are a lot better than you’d expect. And we can take some credit for that. The quality of food in our school lunchrooms — after decades of decline — is improving. Every day we are blown away by the school nutrition professionals we get to work with who care as much as you do about what your kids eat every day. These are their customers and they are demanding. The response has been impressive. It’s just that a lot of us haven’t peeked into the cafeteria recently to see the transformation that’s been happening. If you haven’t, you should. School meals have a solid, balanced nutrient profile. Studies show that the meals kids get at school — in most cases — power them better than lunches sent from home. Think about it. I’m the first to admit that what goes out in my kids — brown bag isn’t always ideal. At the schools where kids regularly, consistently eat school meals, their attendance, concentration, grades, test scores, behavior, and physical activity all improve. The schools actually improve. This is all backed up by valid research, not just stories. When done right, school meals not only increase kids — fruit and vegetable consumption, they increase kids desire to consume more fruits and vegetables because they learn how delicious they are. What parent doesn’t want that? School meals can — and do — impact the choices our kids make outside of school walls. Done right, they can have a lasting impact on their health into adulthood. But there are still so many challenges that keep our kids from having the best school meals experience they can. And those are the challenges Real Food for Kids is working to change. School lunch continues to be viewed as a support service to the instructional day instead of a critical component to student success (just like recess). The environment in which kids eat is less about nourishment — social, emotional and physical — than it is about hurrying on to the next academic subject. And food services staff — even though they are wonderful and love our kids — are often relegated to the sidelines of our school communities, limiting their interaction with our students to a 10-second transactional relationship. 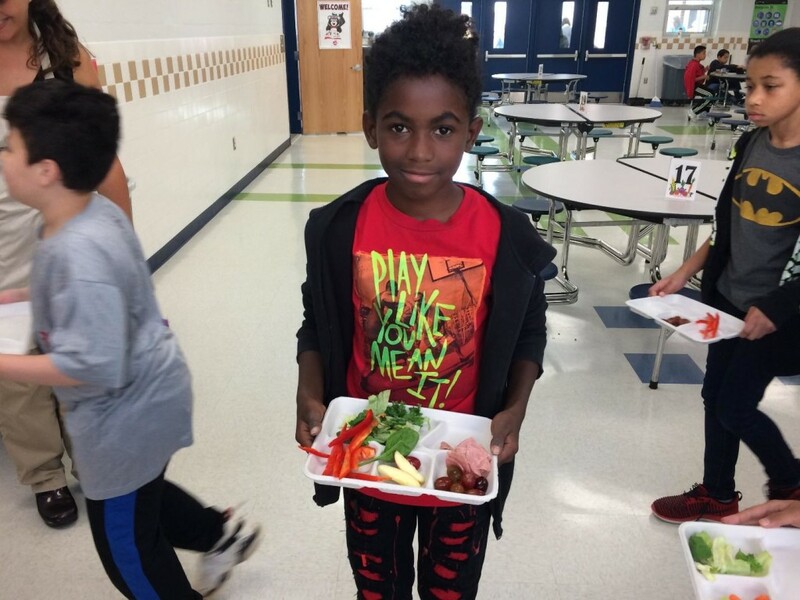 When the culture of the lunchroom becomes integral to the culture of a school, we create an environment in which healthy relationships are organic and lifelong healthy eating behaviors are inspired and embraced. Real Food for Kids‘ work in the Metro DC area over the last 8 years has resulted in changes to the quality of school meals served to over 250,000 kids. Now it’s time to change the environment in which they get those meals so they can be fueled up by the food and the experience, ready to learn, ready to thrive. This fall, our funding will go directly toward work already underway to identify best practices in school meal environments and how to change perceptions so that those practices can be replicated in our schools — in your schools. Your support will go a long way to pushing that tray down the lunch line. This post was written by Mary Porter, Director of Programs. It’s 2pm and I’m standing in a classroom in northwest DC holding a yo-yo. Two brand new Inspired Teaching Fellows (teachers-in-training) are standing next to me, asking me questions. “Do you, uh, think you can do a trick with the yo-yo called ‘walk the dog?’” one of the teachers asks. I try to throw the yo-yo sideways and end up dropping it on the floor. I walk away in frustration. On this particular afternoon, I’ve volunteered to play the role of a student, and the Fellows have been instructed to teach me how to use a yo-yo — but only by asking questions. No statements allowed. My eyes light up. Unlike her first few questions, she doesn’t know the answer to this one. It’s all on me. She may not realize it yet, but this is the space where the magic of learning happens. Now we have a new lesson plan – and I, the student, am in charge of my own learning. This is what teacher training looks like in Inspired Teaching’s Summer Institute, a 3-week long jumpstart for teachers who are beginning the Inspired Teaching Residency. This exercise helps new teachers learn how to provide a space for inquiry instead of a list of directions. And the reason I know this activity so well is because I was a brand new Inspired Teaching Fellow myself, standing in this very classroom, doing this exact activity, 5 summers ago. This summer, however, I’m returning to play the role of the summer mentor. And while I’m stepping into the first year Fellows’ classroom to help out, my primary responsibility is to advise the second year Fellows. The second-year Fellows have just completed their residency year. They’ve been learning from, assisting, and eventually taking over for their lead teacher, someone who has modeled great teaching practices. Now, they’re starting from scratch, in their own summer school classrooms, with a fellow cohort member. I’ve been assigned to help two teaching teams, four teachers total. As the summer begins, I watch my mentees struggle with the fact that, with a brand new class coming in next week, there’s no veteran teacher to set everything up. It’s a bit like learning how to drive a car for an entire year and then finding out that you now need to build your own car out of spare parts. And quickly. Even though summer school is only a month long, it can sometimes feel like an entire school year stuffed into four weeks. 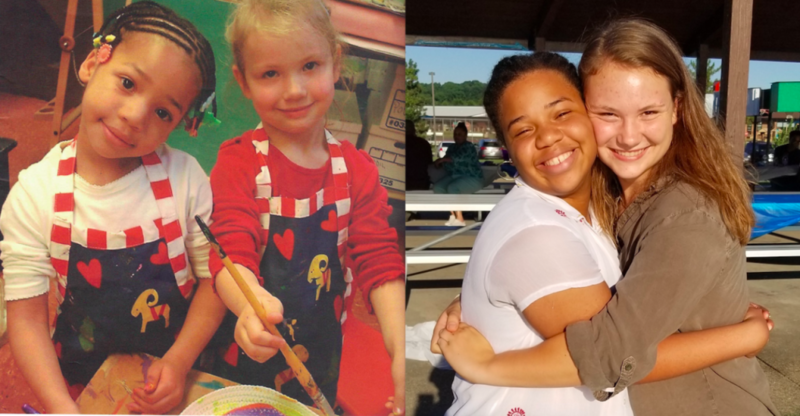 It’s not uncommon for teachers in summer practicum to re-connect and disconnect multiple times with their passion for teaching. 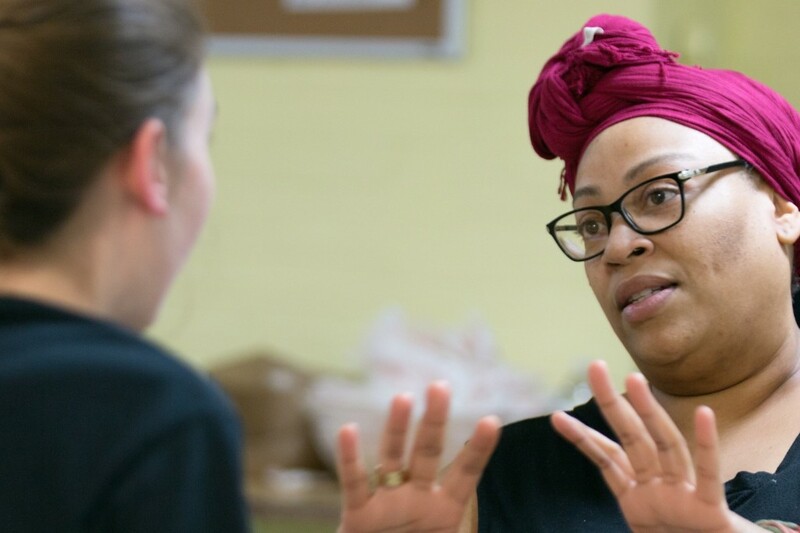 It’s not uncommon for teachers to discover just how much of a gap exists between the teacher that they are and the teacher that they want to be. And it’s not uncommon for those teachers to work excruciatingly hard to close that gap before the summer ends. The result of all of this reflection and learning is evident because, by the end of the summer, I notice that the Fellows’ teaching powers that I am mentoring have grown. At the start of the summer, I would take copious notes while observing a mini-lesson. I’d analyze every movement the teacher made, every word that they said. And by the end, it’s hard to even find a place to take notes. Classrooms are bustling with students in every corner, working on interesting projects and directing their own learning. Remarkably, she is learning to ask herself questions that don’t have an immediate answer. I’ve said before that the role of a teacher is to offer their students a window and a mirror. A window with which to see the world through many different lenses and perspectives, and a mirror to allow students to understand the power of their own perspective and potential. But as a summer mentor, I came to terms with something else: a teacher must also stand in front of their own mirror. It is there, in the glow of their own reflection, where they will do their most challenging work. They will confront every imperfection. They will think about what they will do differently tomorrow. They will, simultaneously, berate themselves and strive for self-acceptance. They will do all of this for the good of themselves and the good of their students. And it occurs to me that I, the summer mentor, have very little to do with the mirror. But maybe, I hold the window. If I was able to help these wonderful teachers catch a glimpse of all incredible possibilities that lie ahead, then, mission accomplished. Story Tapestries invites you to join us on Thursday,?September 27th from 5:30pm – 7:00pm?for an evening of storytelling that will include a film screening featuring Montgomery County community members, a live demo of our digital classroom that contains resources for educators and parents, and some surprises…! Come be part of a dialogue of stories of hope and interact with artists, educators, business owners, caretakers, and other community members. We hope to see you at the Mid-Atlantic Federal Credit Union,?12820 Wisteria Drive, Germantown, MD 20874. Students striving to make better lives for themselves and their communities. 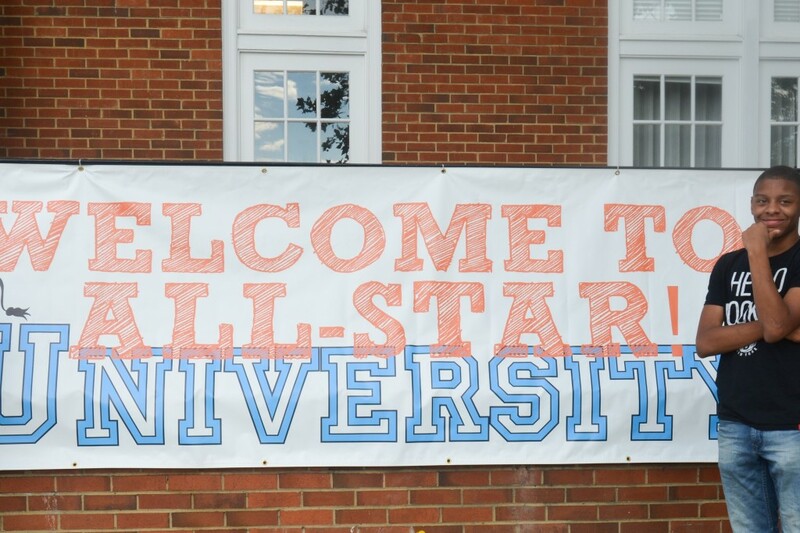 For the past 4 years, After-School All-Stars (ASAS) has convened a leadership training event at the 4-H National Conference Center outside of the Nation’s Capital: All-Stars Leadership University (ASLU). ASAS is a national non-profit, providing free and comprehensive after-school programs to Title 1 middle school students, and the Washington DC chapter is the local office serving over 600 students at 7 schools within the district. 19 of our chapter cities are invited to send student and staff representation at ASLU. Each Chapter sends two youth, a Rising Youth Advisory Board Mentor (YABs) and a Returning YAB Mentor, as well as an Adult Mentor to come to DC and learn about self-leadership, serving others, and how to serve and advocate in their communities. YABs are selected for these positions based on their commitment to the program, as well as their academic performance and leadership abilities. The 4-day retreat includes leadership training, team building exercises, opportunities to create service projects for their local communities and thoughtful reflections on each student’s respective communities and the issues they all face. ASAS DC was extremely proud to have 2 YAB students representing our chapter. Ajani Atkins from Somerset Prep DC and De’Quan Atchinson from Charles Hart Middle School (now a rising Freshman at Eastern High School) both attended earlier this summer. Ajani assumed the role of Rising YAB while De’Quann had the opportunity to be a returning YAB mentor. 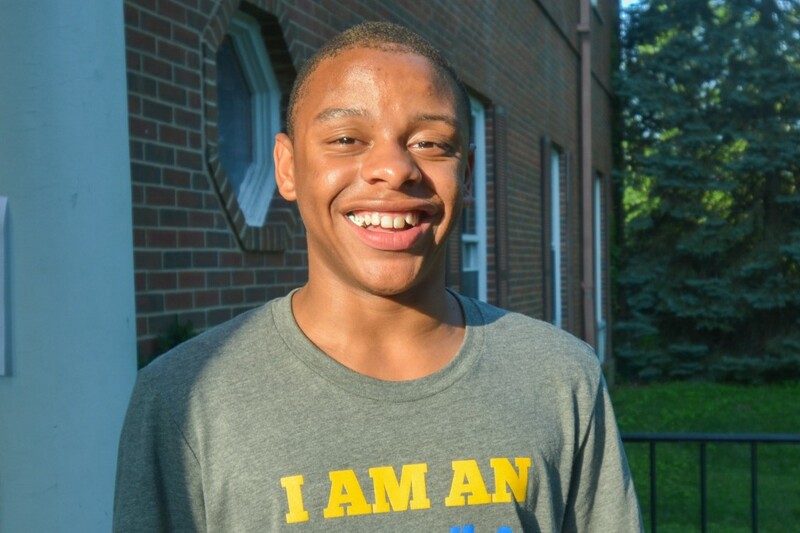 De’Quan is a great example of an ideal YAB and ASAS DC student. He has been with the program since 6th grade and is now a proud graduate of both Hart MS and the ASAS DC program. He has grown immensely in that time, learning to be a better public speaker, convener, and leader amongst his peer group. We had the chance to speak with him about ASLU and his broader experience in the program. De’Quan, along with many of the other YAB participants, was particularly struck by one of the special presenters at ASLU. Thanks to our partnership with Essentia Water, Joe La Puma attended the event as a guest speaker. Joe is the Vice President of Content Strategy at Complex Magazine, and host of the magazine’s “Sneaker Shopping,” a program that takes you inside the sneaker shopping process for such celebrities as Wiz Khalifa, Kevin Hart, Antonio Brown, and A$AP Rocky. De’Quan has a myriad of interests ranging from athletics to community service, but he is also extremely passionate about fashion. It was invaluable for him to be exposed to someone like Joe, who has worked hard to make a name for himself in a progressive sector of work that resonates with our students. Across the country, we are intentional about exposing ASAS students to unique and accessible career paths. Joe’s journey was one that had a profound resonance with the YABS. De’Quan admitted that hearing Joe speak inspired and excited him. It was a narrative that he could genuinely connect with and aspire towards, whereas those sources of inspiration were previously hard to come by. De’Quan looks back at his journey from 6th grade and acknowledges how much he has matured within the ASAS DC program. Initially, he didn’t dedicate enough time to his classes and homework, opting to spend evenings with his mother. Due to her intensive work schedule, they could only spend the late evenings together, and that wasn’t conducive to completing all his work and developing an interest in school. An attitude change was as simple as providing him with a safe space and a positive environment. ASAS DC dedicated academic time allowed him to progress more in his school work, and that culminated this past year when he made the honor roll for the first time in his academic career. He recalled his mother’s reaction, and that she was quite literally “in tears of joy,” overwhelmed by her son’s success. The exciting thing about De’Quan as well as the ASAS DC chapter, is that this is just the beginning. In speaking with De’Quan it was as if his experience in the program gave him a new lease on life. Not only is he excited for high school, but he already has plans to join the track team and as many clubs as he can get his hands on. De’Quan’s 3.5 GPA is something he is proud of, but at Eastern, he wants to build off of that and achieve even higher marks in his first year. He has a strong desire to seriously pursue his interests at the next level in the fields of leadership, athletics, academics, and fashion. As De’Quan reflected back on his experience it was no surprise that above all else, personal connections were the most meaningful to him. He credits ASAS DC staff for “getting him out of his shell” and inspiring him to be a leader. 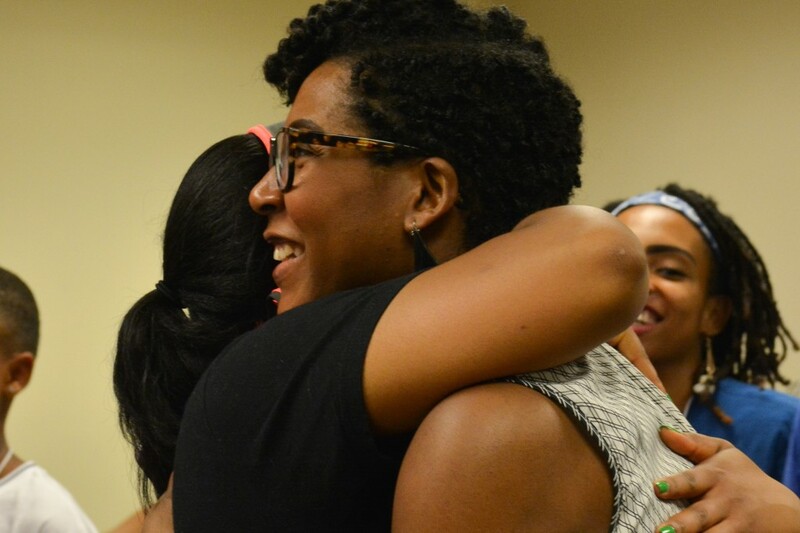 On more than one occasion he referred to the ASAS DC Program Manager Tierra Stewart as “Superwoman,” a sentiment that many of her colleague’s share. 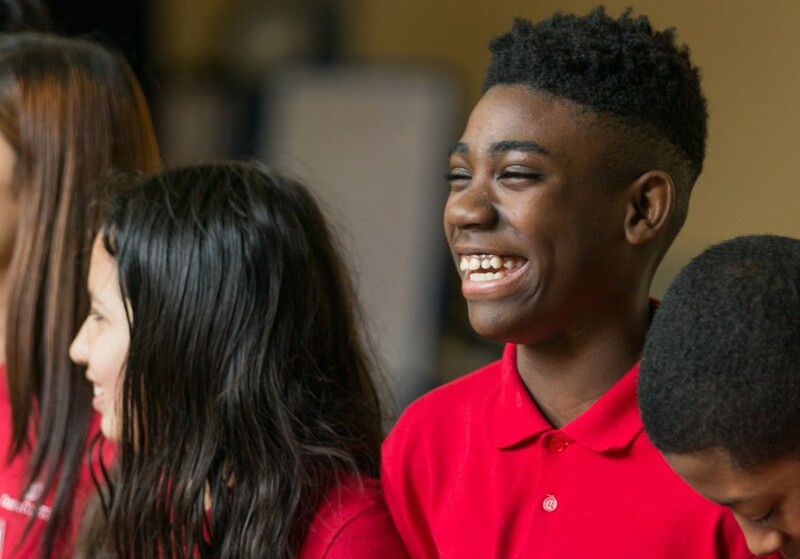 He knows that in 6th grade he wasn’t the type “to open up to just anybody,” but with the help of mentors like Tierra he began to make that transition to a more outgoing and charismatic person. He made that change because he along with his fellow ASAS students understood that our instructors genuinely cared about their well-being and future. 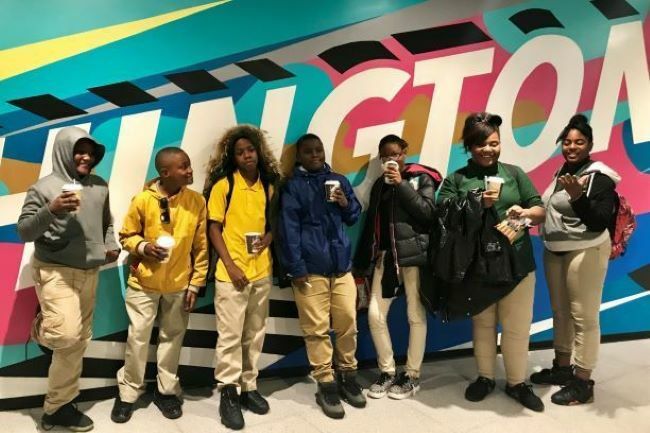 As is the case with many of our 600+ students in the district, our staff have close relationships with De’Qunn and his family, and that level of understanding and communication is inextricably connected to his growth and success. The DC chapter is proud to showcase De’Quan’s story. It is a unique and compelling narrative, and at the same time, we know that there are tens of thousands of ASAS students across the country having a similar experience. He didn’t have time to complete his homework, ASAS DC provided him that time and space, he was shy and unmotivated, he is now going off to high school as a leader with aspirations to be the captain of every team and club he joins, he wasn’t sure what he wanted to do with his life, ASAS DC showed him what it looks like to succeed in school and have an attractive career. As he reflected back on his own journey at the 4-H center, eyes welling with tears, his heart was full: for his family, his ASAS mentors, and mostly for his fellow students that are striving to make better lives for themselves and their communities. Almost ten years ago, 40 student-athletes gathered in the living room of a two-bedroom apartment near Georgetown University. Their goal: fight alarmingly high, increasing rates of HIV transmission in our nation’s capital the best way that they knew how –through sports. Drawing inspiration from his volunteer experience with Grassroot Soccer in South Africa, the group’s leader, Tyler Spencer, wanted to use sports to educate people about HIV and AIDS prevention in a language that they could understand. At the time, 1 in 20 adults in DC were living with HIV, and the rate among teenagers was on the rise. To call this group of Georgetown soccer players, football players, basketball players, field hockey players, rowers, swimmers and golfers a “grassroots” organization would be an understatement. 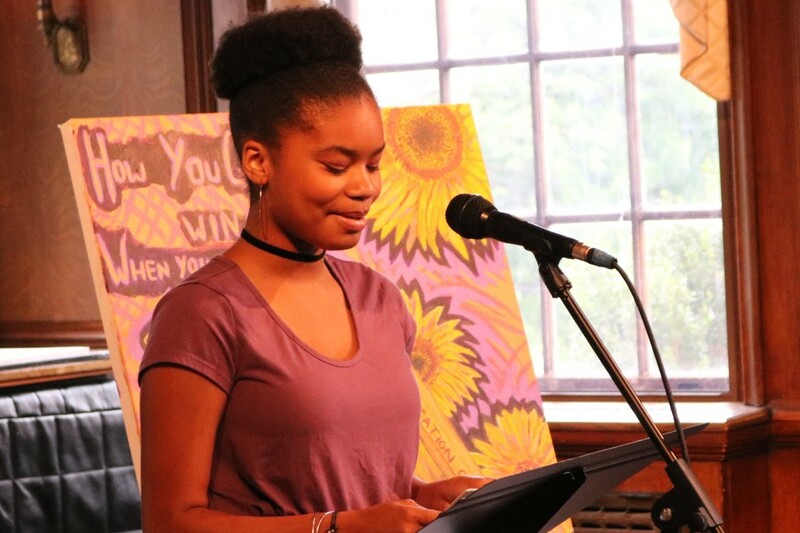 Despite their lack of funding and uncertainty in starting and running a non-profit organization, the 18 to 21-year-olds persisted. Much of the initial program cost fell on Spencer. He took a temp job working with the Association of Schools of Public Health, and with the support of the athletic community, they facilitated their first sexual health program in The School Without Walls at Francis-Stevens in the Spring of 2009. 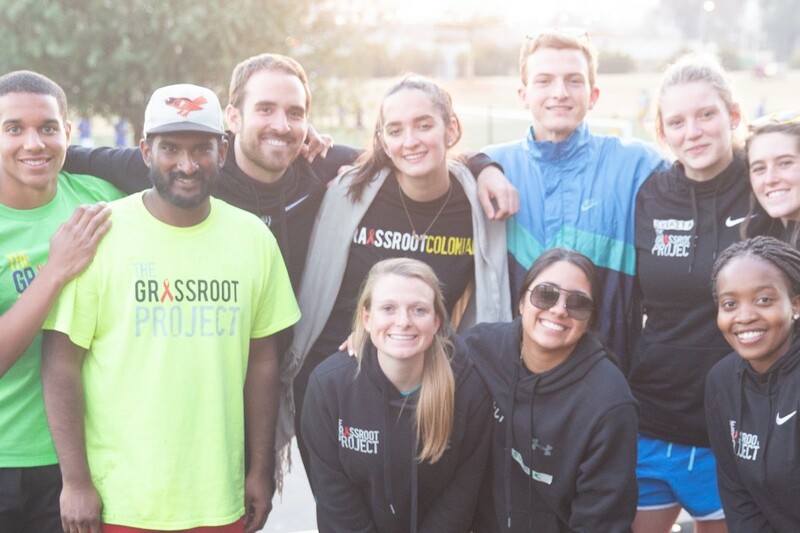 Today, The Grassroot Project’s?innovative model continues to employ non-traditional health educators — NCAA student-athletes — to create a fun, friendly and safe environment in which participants learn how to live healthier lifestyles. The peer to peer education method creates an open environment for participants to share their beliefs on sensitive topics such as HIV/AIDS testing and prevention, sexual consent, dating violence, and healthy relationships. The use of sports as a vehicle for social change, and the ability of the student-athlete leaders to connect with the youth and their families are what make this an effective way of learning. TGP’s?corps of volunteer student-athlete program facilitators has expanded from Georgetown University to now also include student-athletes from The George Washington University, American University, Howard University and the University of the District of Columbia. Most recent additions to the organization include Grassroots Connect — an end-of-program graduation celebration and linkage to local health care event — as well as Grassroots Fam — an after-school parent/caregiver program that provides similar interactive learning opportunities including sexual health basics, as well as building a parental support system by practicing proper parent-child communication. 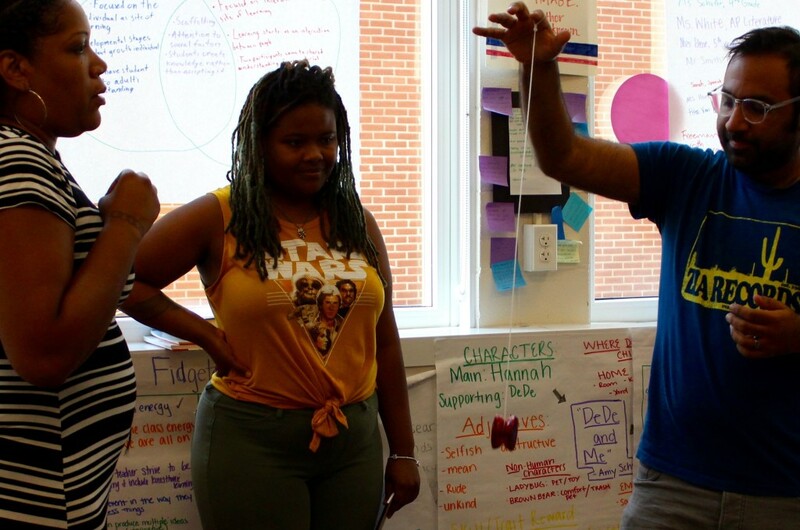 During the summer of 2018, the organization introduced its first Master Trainer program — a team of exemplary student-athletes who’ve undergone an intensive training on social issues in DC, sexual and reproductive health basics, and behavior management skills in middle schools. The Master Trainers traveled to South Africa this summer to learn from partner organization, Grassroot Soccer, about best practices for training new student-athlete facilitators. What started as a true grassroots organization has morphed into a robust network of students, athletes, and alumnae who are educated about living healthier lifestyles in their communities. “The Catalogue has been and will continue to be helpful in preparing us for to make an even greater impact on our city,” said Spencer. The Child & Family Network Centers (CFNC) is holding its annual School Supply Drive during the summer months before the start of the new school year on September 5, 2018. CFNC is collecting hundreds of school supplies to stock our 8 pre-kindergarten classrooms across the city of Alexandria. These supplies will give 138 disadvantaged children what they need to be successful in school, starting on day one. Community members can donate new school supplies and classroom materials by dropping them at CFNC’s headquarters — 3700 Wheeler Ave, Alexandria, VA 22304. CFNC is also happy to arrange pick up of supplies. The wish list includes basic school supplies such as paper, glue, and folders, as well as other items that are consumed frequently, such as tissues and paper towels. CFNC’s school supply list can be found on their website. All donations of school supplies are tax-deductible. The Child & Family Network Centers (CFNC) provides free preschool education for 138 children and families living at or below 250% of the poverty line, who earn too much to qualify for Head Start but not enough to afford their children with a private preschool education. 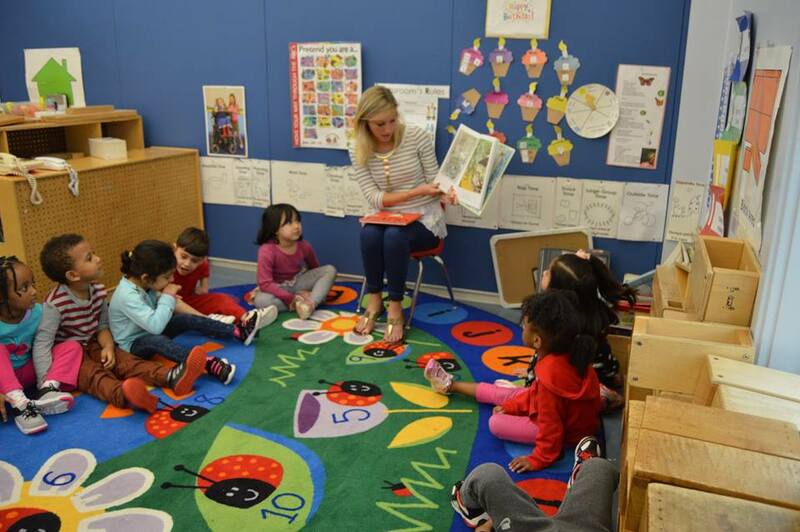 Providing a unique blend of preschool education and family support services including free health services, in-home visits and counseling, CFNC currently operates 8 classrooms in apartment complexes, recreational centers and other locations throughout Alexandria where these families live. Learn more. Every year, DC Collaborative serves thousands of students in the hope that we can encourage them to embrace and pursue the arts and humanities. We were delighted to discover the story of Cameron Gray and Erin Fenzel, two students who have demonstrated exactly that! At the age of 4, they started school together at Peabody Elementary School. 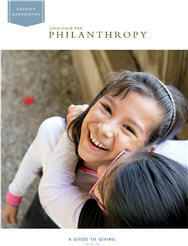 They had attended one of our AHFES field trips, where a picture of them painting together (above) eventually made it onto the cover of the 2007-2008 issue from Catalogue for Philanthropy. Fast forward 14 years later. 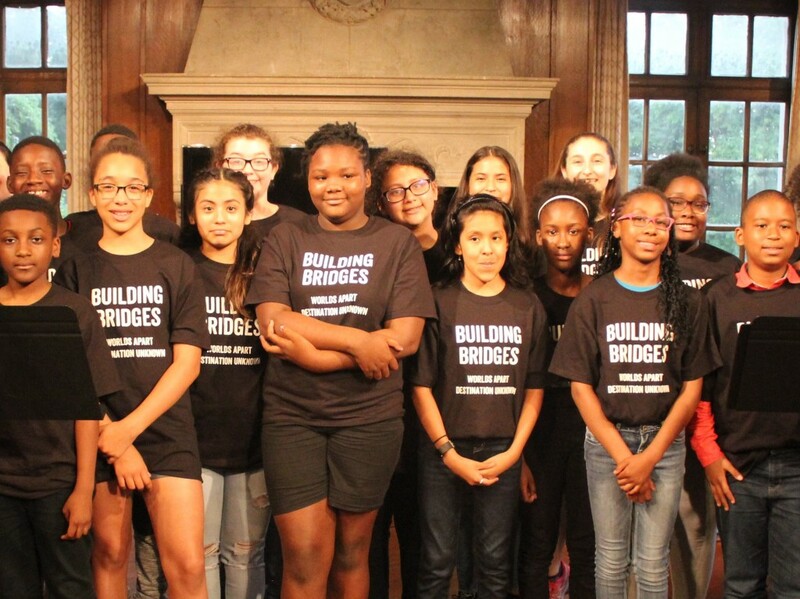 After going through middle school and high school together, they recently graduated this year from School Without Walls, which is ranked the #1 Top Performing High School in the District and #51 in the country. Their pursuit of education doesn’t end there. This fall, Cameron is headed to Syracuse University in New York to study Film, while Erin will go to Saint Joseph’s University in Pennsylvania to study International Relations. The DC Collaborative team is so proud of where these two students are going and we wish them the best for their futures. We’d like to give a special thanks to their parents and Catalogue for Philanthropy for sharing this wonderful friendship to us! If you know of any students have participated in our program and where they are now, please reach out to us at info@dccollaborative.org – we’d love to follow up with them.